As a continuation of last weeks post, I will continue on the different characteristics that you should look for in a mat for your ESD application to ensure that you are running workstation that is up to ESD standards. 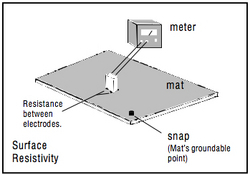 The electrical properties are essential to be able to tell whether a mat is conductive or dissipative. 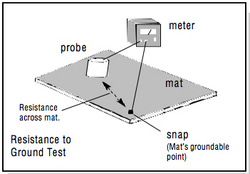 EOS/ESD Standard 4.1 outlines the proper test methods for mats. When testing the mats there are two electrical measurements that need to be made. These two measurements are the Resistance Top to Top (RTT) and Resistance Top to Ground (RTG). For mats this is the most important electrical test. 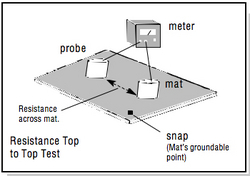 This test shows the mats ability to conduct static from a point on the mat's surface to the mat's ground point. EOS/ESD Standard 4.1 guideline for RTG is <1010 ohms. A revision of S4.1 will likely change to the RTG range to 106 to 109 ohms. By measuring the resistance between two widely separated points on a mat's surface, we can be certain that all of the areas of a mat conduct static at the same rate. This test can also reveal cut or damaged center layers of multi-layer mats. EOS/ESD Standard 4.1 guideline for RTT is >106 ohms. A revision of S4.1 will likely leave RTT unchanged. A surface resistivity test does not reveal much about the mat's ability to perform correctly. The only benefit that this test provides is to differentiate between ESD and non-ESD mats, and to monitor the mat for cleaning. Dirt can act as an insulator on a mat, therefore by monitoring the mats resistivity a cleaning schedule can be arranged. However the RTG and RTT test can serve this function as well. For further information on the electrical properties of mats or any other information regarding this topic please check back every Thursday for further posts, or view the SCC's Technical Bulletin Posts. To view the ESD standards please visit the Electrostatic Discharge Association Website listed in our affiliated sites. Call Bob Ikola at 714-879-1036 for immediate assistance.